I (Guru Gobind Singh), have no throne, horse, falcon, or army. However I have the blessings of the Almighty God who is the giver of the pleasures of Heaven. So, I will never give up to tyranny! In 1685, the young Guru Gobind Rai sat on the banks of the river Jamuna at Paonta and contemplated the glory of the One God in an ecstasy that could not be contained. Having left the city of Anandpur Sahib a few months earlier, his exalted mind found the gentle peace of Paonta Sahib to his liking. At nineteen years old, he was the undisputed leader of the Sikhs. Still unproven in battle, he was soon to face his first test of the sword. The 10th Guru of the Sikhs, Guru Gobind Singh, was born Gobind Rai in the village of Patna in the eastern province of Bihar. He was the only child of Guru Tegh Bahadur Ji and Mata Gujri ji was born on the 7th night after the new moon, December 22nd, 1666. Just as all children are reared in the laps of their mothers, the Tenth Guru grew up kicking and playing in the lap of Mata Gujri ji. His grandmother, Mata Nanaki and his uncle, Kirpal Chand loved and protected him in the early days of his infancy. However his youth was short lived, and he shouldered the responsibility of the Sikh nation when his father was martyred at the hands of the Mughal Emperor in Delhi when he was only nine years old. Guru Gobind Singh writes in his autobiography, the Bachitar Natak, that he was born into this world with a mission to protect the good and saintly people, and to uproot the tyrants and evil doers. This could only be done by living a life of action, courage, and leadership. As the Guru matured into a man, he exemplified these aspects. He lived amongst his people, not separate from them – a saint and solider, a man of the world yet a master of the divine. He lead them every step of the way, protecting them from aggression and oppression and sacrificing every facet of his life for the common good. 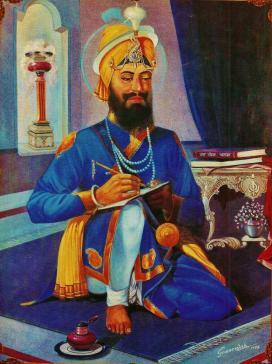 He created the glorious order of the Khalsa out of the common people of the Punjab with unique form that made them stand apart in a crowd of millions. But in 1685, Guru Gobind Rai was still a youth of nineteen, and that hard road of destiny was a few years away from unfolding. He spent his days in Paonta Sahib as a poet and a scholar – teaching, learning and sharing his love for the One Lord. It was during this time that the Guru wrote his powerful prayer – Jaap Sahib. The Jaap Sahib is 199 verses composed in five languages, in rhymed couplets of defined and sophisticated meter. It does not narrate a story, and does not depart philosophical wisdom. Instead, it calls out 950 names of the unformed and limitless Creator. Some couplets speak of what God is, and others speak of what God is not. Together the words and rhythm create an experience of God that supersedes mere intellectual understanding. The rhythm of Jaap Sahib is like that of a horse at the gallop, and the beat of the hooves drum martial spirit into the heart. The cadence of the Jaap Sahib is used for marching, martial practice, and dance of the pantra. The Jaap Sahib is written in ten distinct meters, or Chands, that weave into the experience of the practitioner. A chand is a verse in which the syllables and the rhythm are arranged in a precisely controlled pattern. Chhapai Chand, Rual Chand, Rasaawal Chand, Harbolmana Chand and Ek Acchhri Chand are used just once, Charpat Chand, Madhubhar Chand and Bhagwati Chand are used twice, Chachri Chand five times, and Bhajang Prayat Chand six times. The construction of the chands is complex. For example, Madhubhar Chand is defined as four “feet”, or lines, with 16 syllables and a pause after every 8 syllables. Rasaawal Chand has four feet with each foot consisting of 24 syllables and pauses after the 11th and 13th syllables. So although the phrases roll easily off the tongue, they are sophisticated in design, disciplined in nature, and produce a consistent impact on the consciousness. More than the outpouring of ecstasy from an enlightened personality, the Jaap Sahib is a complex, precise, mathematical composition from a brilliant mind designed to evoke a specific response from the human psyche. All this came from the phenomenal Tenth Guru as a teenager about to embark on the journey of life. The Jaap Sahib is now the opening bani, or verse, of the holy Dasam Granth Sahib – the collected writings of Guru Gobind Singh It begins with the Mangla Charan which introduces and sets the stage for the bani. Unlike other bani of the Siri Guru Granth Sahib, the Jaap Sahib starts with “Siri Mukhvak Patishai Dasavee – from the Great Mouth of the Tenth King.” In the Siri Guru Granth Sahib, we read Mehela Pela – which refers to the First Guru Nanak Dev ji, Mehela Duja – referring to the second Guru Angad Dev ji, etc. This is a feminine reference – mehela – acknowledging that all beings take the posture of the feminine before the One God. “Nowhere has Mehela Dasavaa been used because tradition, conception, and experience had changed. That is the combined character of a Sikh, to be a solider and a saint in one person. Shastra and Shaaster – the spiritual knowledge and the technology of self-defense – have to be together in one person. That is what Guru Gobind Singh gave us with absolute flawless detail” In the Dasam Granth Sahib, the Sikh stands as a soldier saint before God. In the Mangla Charan, Guru Gobind Singh promises – “Who can ever recite all Your Names! By your Grace, describing your actions we come to know You.” Karam Nam – Naming the actions of the One God – is the essence of the Jaap Sahib. By reciting Karam Nam, Guru Gobind Singh gives his Sikhs into an experience of the transcendental far beyond the rational faculty of man. The Jaap Sahib is a self-manifestation of God that delivers the listener, as well as the speaker, to a level deeper than intellectual understanding. As described by Dr. Jaspreet Kaur, “In the opening of Jaap Sahib, [Guru Gobind Singh says that] God had no physical appearance, no caste, no garb or signs of palm-lines which are the sign that help man recognize or distinguish anybody. He is perpetual, self illuminated, and measureless in power. God is the king of kings and God of millions of Indras. He is sovereign of three worlds, demigods, men and demons; and the woods and dales proclaim Him as indescribable.